PLANTING: Start from cuttings or divisions in spring or fall, plant anytime from containers. Start seed in winter and make transplants in the spring. BLOOM/FRUIT: Flat-topped umbels produce seed. ve. Easy to grow in well-drained soil. PROBLEMS: Some varieties grow tall and need to be staked. Will spread and can become a pest in refined gardens. HARVEST/STORAGE: Harvest flowers at peak of bloom and the foliage anytime. CULINARY USES: Flowers are used in soups and cheese as well as in salads when chopped finely. Also used to flavor liqueurs and in herb teas. The leaves are toxic. MEDICINAL USES: Taken as a tea, yarrow flowers are good for colds and the flue. It also reduces blood pressure as a blood-clotting agent and is an antiseptic and good to fight yeast infections. Avoid using during pregnancy and overuse anytime. Should only be used in small doses. Overuse can make skin sensitive to sunlight. Leaves will help stop bleeding when used topically. LANDSCAPE USES: Beautiful in landscape but can be invasive. A. millifolium is a white flowering native plant. 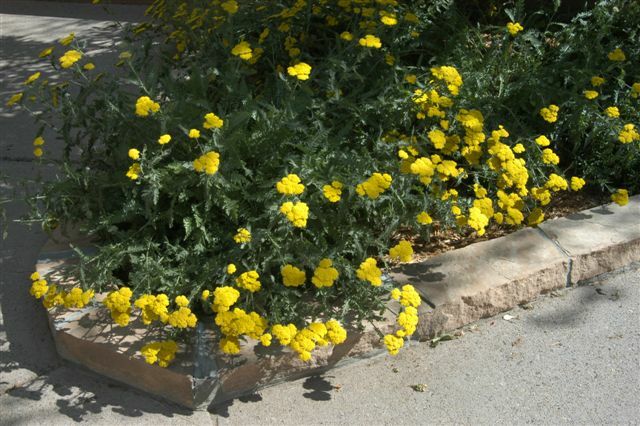 INSIGHT: It is an excellent choice for a splash of color in the herb garden and requires little maintenance. The tall, showy flower heads are popular everlasting in dried arrangements.